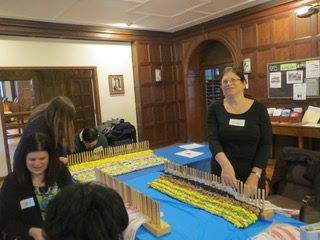 The Sleeping Mat Project has begun at Or Hadash, thanks to Eileen Kupersmith and Barbara Weisman. Join the group at OH 10:30 am – 12:00 noon on select Wednesdays to make sleeping mats for homeless people out of recycled plastic bags. These lightweight mats provide insulation from the wet and cold ground. At the same time you are practicing the values of Bal Tashchit (do not waste) and Tikkun Olam (repair the world). Please bring friends with you! Questions: Eileen Kupersmith 267-664-3050. On January 14th, there was a reception to honor Integrate for Good. Or Hadash was the recipient of a Community Hero Award (along with 8 other heroes)! What a wonderful surprise! There were photos of us at Or Hadash, and a long speech. There were over 70 people in attendance. Bev Weinberg, Founder of Integrate for Good, presented the certificate and this jar of mints with the clever sign thanking us for our CommitMINT, our EncourageMINT; our InvestMINT; our InvolveMINT; and our help in creating an EnvironMINT where everyone’s talent can be valued. Come join us for mints (and other refreshments) and good company! Future dates: 12/12, 1/2, 1/16, 1/30, 2/13, 2/27, 3/6, 3/20, 4/3, 4/17, 5/1, 5/15, 5/29, 6/5 See you in September!